Directions: Put oatmeal in a bowl and add salt and baking soda. Making a well in the centre and pour in meted butter. Blend together in enough hot water to make a stiff paste, then knead and roll out as thinly as possible. Cut into triangles and bake on a floured tin in a moderately hot oven 400 degrees, until the ends curl up and the cakes are crisp. This should take 20 mins to 30 mins. You could alternatively, bake them on a hot girdle or frying pan. Can be served with butter cheese or honey. 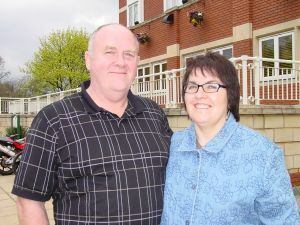 Ian and Anna Stewart, FMIN Partners and FMIN Directors in England both originally grew up in Scotland. Together they minister in churches and spend time encouraging our European Partners.